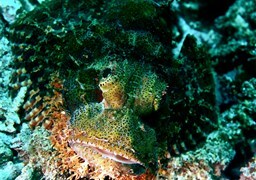 When it comes to scuba diving, there are few places in the world as exciting as Bali. The very name of Bali conjures up exotic images of island wildlife, unique culture and the many different marine life that call the surrounding waters home. 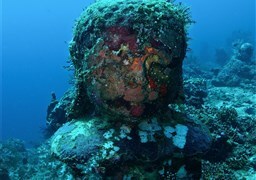 Bali is a marvelous place to visit and for scuba divers it is certainly one of the most impressive. 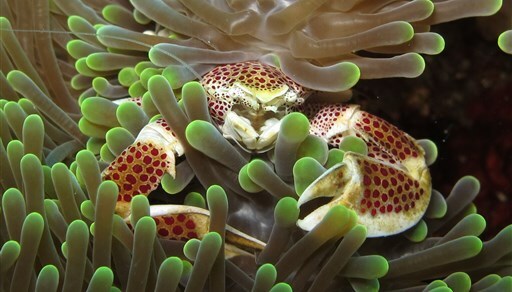 Whether you are just beginning your adventures under the sea or have been scuba diving for years, Bali is a must-see place that offers many different examples of marine life mixed with colorful coral formations that create a truly unique world. 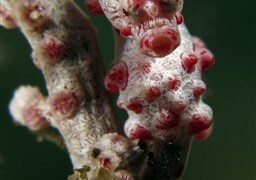 The general conditions as they apply to Bali will depend in large part on where you want to dive. 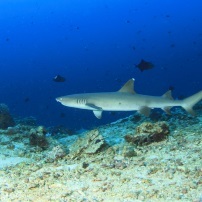 Generally speaking, staying on the north or east side of the island is the best place because most of the renowned dive sites are located in this area. In addition, you can join “Safari” where you can travel all around the island and visit the various diving locations for a wonder adventure all while staying in fine hotels to rest up between dives. With over 50 dive sites, there is something for everyone in Bali as beginners up to the advanced level can find dive sites that will meet their particular skills. 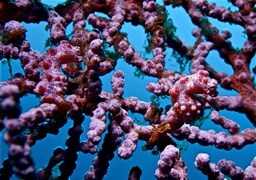 Diving season in Bali actually lasts the year round. 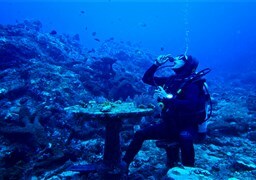 However, conditions will change at the various diving places from time to time. The rainy season is from November to March, but in truth there is very little rain that falls. For those who want the most privacy when they dive this is the best time of the year as there are fewer divers in general in the area. 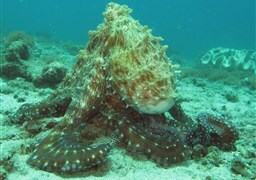 However, you might find that the visibility of certain dive sites are reduced somewhat. The water temperature at this period is at a pleasant average of 27 degree Celsius. 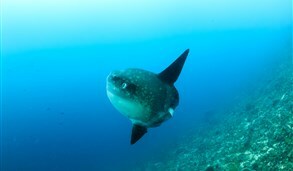 The water during the dry season is at a temperature between 20 and 25 degree Celsius which are the best condition to spot the Mola-mola (Sunfish) who prefer a cold water temperature. 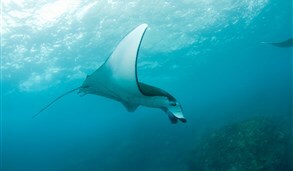 The manta ray can be spotted all year round. 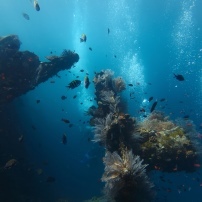 If you plan on diving around Tulamben, one of the most popular dive sites in Bali, then the best conditions are found from April to July along with October and November as well. This is the dry season and the visibility is at its best during these months. 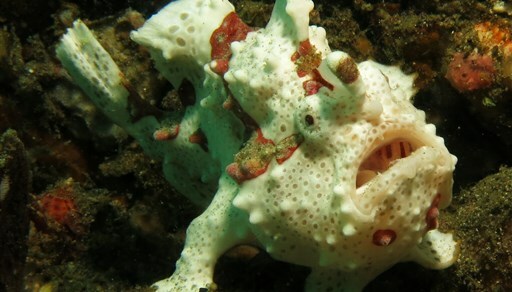 There are a number of incredible places to dive in Bali, particularly for those who have experience in scuba diving in other places in the world. 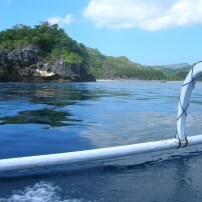 However, there are diving spots for beginners that provide a unique view of the underwater world that is simply stunning while being very safe for divers. 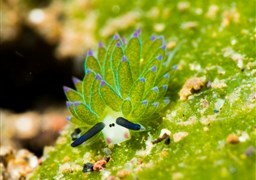 What follows are four of the best spots in Bali to dive. 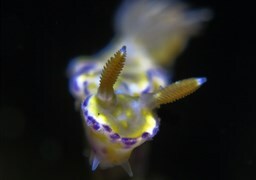 Padang Bay is right next to Amuk Bay and has numerous dive sites suitable for amateur and professional divers alike. Blue Lagoon, Tanjung Jepun, The Channel and The Jetty are the primary dive sites here. 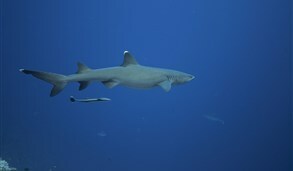 Reef sharks, ghost pipefish, turtles, pygmy seahorses and pelagic fishes are common around the area. 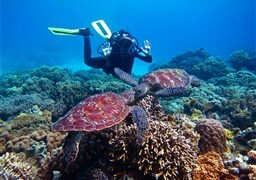 Tulamben is located on the northeastern region and has many splendid dive sites. 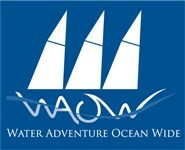 It receives major currents from the Pacific Ocean to Indian Ocean and has an exceptionally diverse ecosystem. 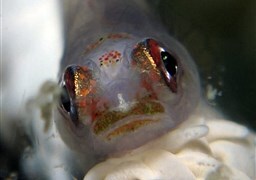 USAT Liberty is one of the best wreckage in the world and lies on a slope of black sand at a depth of about 9-30 m. It is 120 m long, colourful and over 400 species of fishes can be found living around. 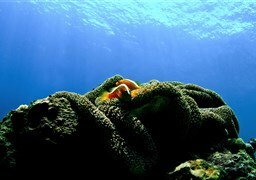 Amed is one of the first diving areas of the island ideal for macro and muck diving and has several splendid dive sites. 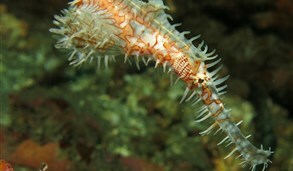 It is very close to the Volcano Mount Agung with black sand and is famous for Mimic Octopus and Ghost Pipefish. Famous dive spots in the area are Ghost Bay, Amed Reef and Jemeluk, all equipped with light current and crystal visibility. 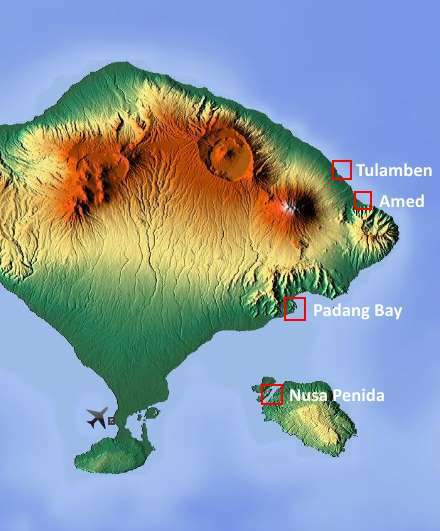 Nusa Penida is the area where Manta ray and Mola-Mola (sunfish) can be seen. 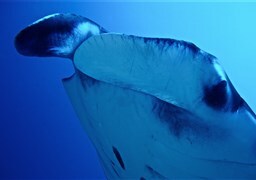 Manta ray can be seen all year round while Mola-Mola is seen most of the time during the dry season. 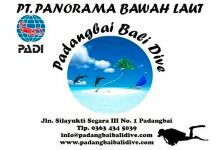 All these places can be reached easily from Padang Bay. 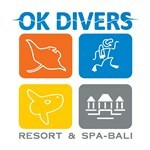 You will find there dive centers guiding on all the important dive sites around Bali. 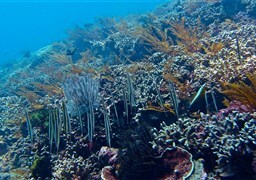 There is an amazingly diverse number of fish and coral life that surrounds Bali. 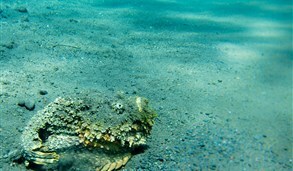 Here, you will find a number of fish including the famed Mola Mola or Oceanic Sunfish which can be found during the dry season especially in the Crystal Bay diving area of Nusa Penida. 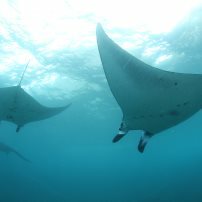 There is also the ever present Manta Rays which can be found in different places as well, especially “Manta Point” in the Nusa Penida diving region. 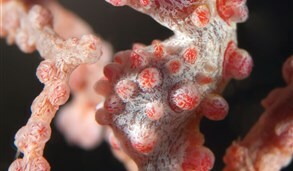 In addition, you will also find a number of other fish and marine life including the following : Whitetip Reef Sharks, Barracuda, Giant Trevally, Ornate Ghost Pipefish, Mimic Octopus, Pygmy Seahorse, Flamboyant Cuddlefish, Frogfish, Leaf Fish, Turtles, Nudibranchs and More! Of all the islands in Indonesia, Bali is the most visited and popular tourist destination for good reason. The unique culture and emphasis on the arts has made it one of the most fascinating places on Earth. For the times in which you may want to diversify your scuba diving in Bali, there are many places to explore on land as well in one of the most exotic islands in the world.